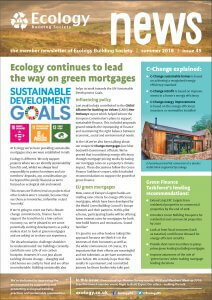 The latest issue of Ecology News, the newsletter for Ecology members, is now available to view here. The summer 2018 issue highlights how policymakers in the UK and Europe are starting to recognise the importance of the financial system in the transition to a low-carbon economy and how Ecology is supporting this through sharing our expertise in green mortgages. It also includes information about the recent launch of Ecology’s improved online account management service and the results of our latest Member Survey, as well as a round-up of some of our key achievements so far this year. We’re also inviting our members and supporters to join us at a free event to launch a new documentary film exploring how community-led housing offers a sustainable fix to the housing affordability crisis. We do hope members enjoy reading about how we’re making a positive impact and we’d like to take this opportunity to thank all our members for their continued support.